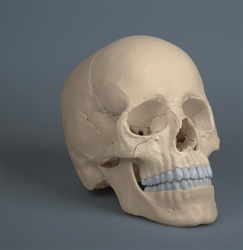 This fascinating model of an average European adult skull can be disassembled into 22 single bones. During development of this model one of the main targets was to make the model easy to assemble and dismantle. Stable parts with convenient magnet connections make handling of the product a child‘s play. The detailed bones do not need any complicated pins to be stuck into holes, they almost slide into position, guided by realistic bone sutures and held by strong magnets. The perfect tool for study. Anatomical version. Made in natural bone color. The magnetic connectors solve the problem of the prior leader (Somso 14-part model) which was that the plastic connector plugs break off or stick, making the model sometimes hard to assemble. Also this version has the hard palate correct, whereas the 14-part wrongly shows the maxilla and palatine as just one unified bone. This was a gift for my sister who is working on her PhD in biologic anthropology. She loves it and refers to it all the time while reconstructing skulls.